Heat oven to 350°F (if using dark or nonstick pans, heat oven to 325°F). Grease two 9-inch round cake pans with shortening; lightly flour. In large bowl, beat cake mix, water, oil and egg whites with electric mixer on low speed 30 seconds or until blended. Beat on medium speed 2 minutes, scraping bowl occasionally. Pour batter into pans. Bake 23 to 28 minutes or until cake springs back when touched lightly in center. Cool in pans on cooling rack 15 minutes. remove cakes from pans; cool completely, about 30 minutes. Stir raspberry preserves until smooth; cover and set aside. Meanwhile, in large bowl, beat shortening and butter with electric mixer on medium speed until creamy. Add powdered sugar; beat until smooth. Beat in 2 tablespoons kirsch. Beat in additional kirsch if necessary for soft spreading consistency. Set aside. To assemble cake, trim cake layers to even off. Place 1 cake layer, trimmed side down, on serving plate. Spread with 1/2 cup frosting. Spread evenly with raspberry preserves. Top with remaining cake layer, trimmed side down. Spread top with 1/2 cup frosting, smoothing top to form flat surface. Reserve 1/2 cup frosting for piping. Spread side with remaining frosting. Place reserved frosting in small decorating bag fitted with small star tip. Pipe decorative edge around top and bottom edge of cake. In small saucepan, mix juice concentrate and cornstarch. Heat to boiling over medium-low heat, stirring constantly, until thickened. Remove from heat. Cool until thickened mixture is room temperature, about 10 minutes. Spoon on top of cake. Spread to piped edges of frosting. 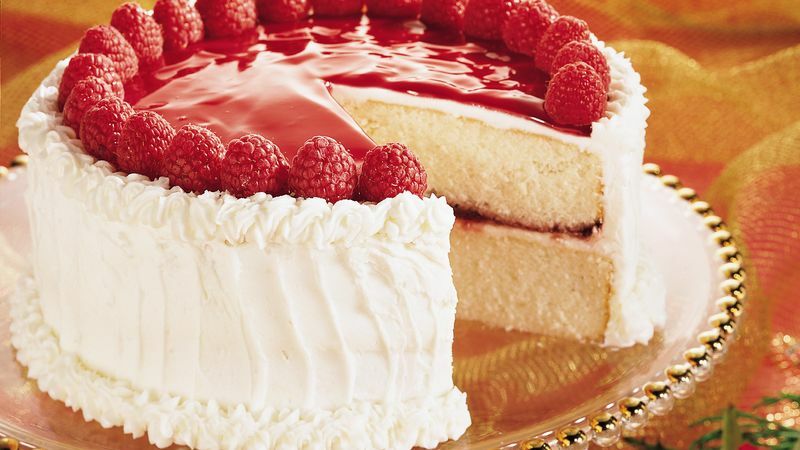 Before serving, arrange raspberries around top edge of cake. Garnish with mint sprigs.